Will Artificial Intelligence Make Doctors Obsolete? When many of us think of artificial intelligence in healthcare, an image of a distant Black Mirror-esque dystopia comes to mind. However, it is soon becoming a positive presence in many aspects of the medical profession. 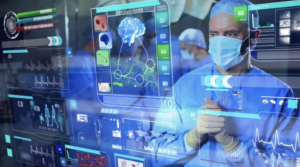 Artificial Intelligence (AI) is dramatically changing the future landscape of medicine, diagnosing diseases with an accuracy that surpasses even the trained eye of a seasoned physician. Currently, the process for diagnosing metastasis of cancer is time consuming, requiring pathologists to manually go through scans with meticulous attention to detail. Google researchers have created an AI framework to detect tumors, a “convolutional neural network” which is modeled after the neural networks in the visual cortex of the brain. They have trained it to produce a “tumor probability heatmap” of each section of a scan. It detects tumors at a 92.7% accuracy rate, compared to the 73.2% accuracy of a human pathologist. Another diagnostics tool developed by researchers at Oxford University is capable of diagnosing heart disease more cost-effectively, catching signs of heart disease early on with greater than 90% accuracy. It locates minute irregularities that cardiologists might overlook by analyzing more than 80,000 data points from an echocardiogram, a test that uses sound waves to construct images of the heart. The third leading cause of death in the US, behind heart disease and cancer, is medical error. The effects of physician fatigue, caused by lack of sleep and a stressful work environment, can be fatal to the patient. However, AI works objectively with large collections of data, demonstrating unmatched abilities of pattern-recognition. Clearly, AI can be useful in helping doctors process data more efficiently and reduce the risk of human error. Of course, the era of artificial intelligence in healthcare comes with its own host of ethical debates. Would people trust AI to make life-altering decisions for them? Can a code effectively make ethical decisions? Can AI replace the inherent humanity of medical practice? All talk about technological prowess aside, AI is still a long way from achieving the characteristics of empathy and compassion that go hand in hand with healthcare. As John C. Havens, the executive director of IEEE Global Initiative on Ethics of Autonomous and Intelligent Systems, puts it- “There’s an irony in saying computation is all there is to a person”.